We originally were up in the air about what park to attend on this day. The debate was save Disney World until Baby Cute was old enough to enjoy it as well or go ahead and do it. After seeing how well the kids did at Animal Kingdom we decided to go ahead and do it. We woke up nice and early to try to be one of the first ones in the park. We actually even took a cab to try to beat the busses. We arrived early...or so we thought. It was a "Magic Hour" day so the park opened an hour earlier than normal. The park was already jam packed with fellow guests, not to mention the Disney Princess Half Marathon weekend was kicking off, and everyone seemed to be there early. And again, we saw people running in. We had learned from the previous day to fast pass, so this didn't make us as worried. Everyone in line seemed to be running to the Mine Train first. So when we walked into the park took it slow, grabbed one of the cast members to help with photos, and then we went in the complete opposite direction towards Adventureland. On our way The Cutes spotted Chip & Dale and there wasn't a line so we broke out our autograph books and they were able to spend a ton of time with them. The lines definitely weren't long on this end of the park to start. Tip #7: This is for the Disney first timers, but the Disney app was so helpful on checking line times. We knew where to go to keep our waits to a minimum and it was pretty accurate on updating to real time. The Pirates of the Caribbean ride was one of my favorites as a child and I knew my pirate loving little ones would love this one. And as soon as we got off the ride, we stumbled upon Captain Jack Sparrow's Pirate Tutorial. The Cutes loved this interactive show. 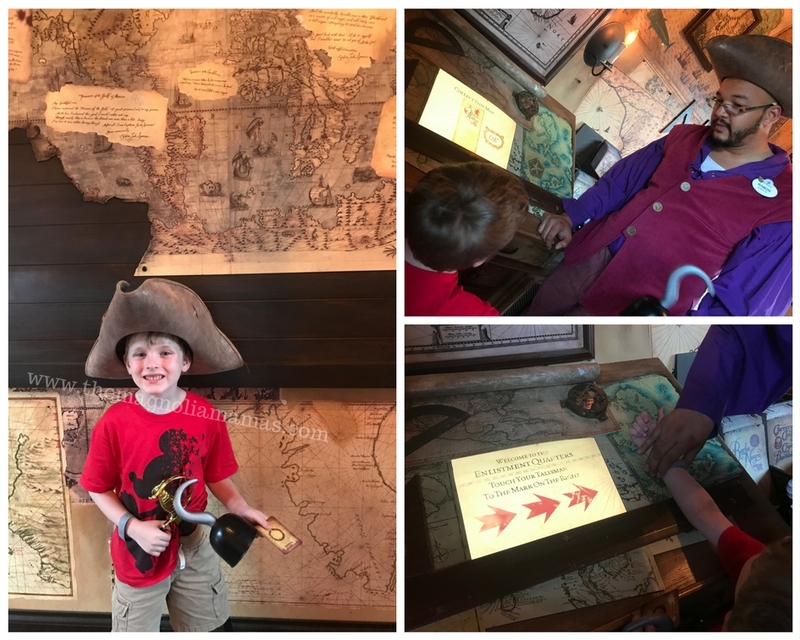 They learned to sword fight, speak pirate, and become officially part of Jack's pirate crew with an official pirate scroll. They kept telling everyone they met they were now pirates. And this must have really resonated with Cute because he was allowed to choose a souvenir and all he wanted was to be just like Captain Jack. Later in the day, after we circled the whole park, he went right back to Adventureland to get his gear. At this point in the day both girls were also crashed out in our double stroller so we let Cute check out the Pirate's Adventure: Treasure of the Seven Seas Quest. This became his obsession the rest of the day. He was so intent on finding all of the hidden clues Captain Jack left behind. Definitely a fun activity to do with your pirate loving little ones, especially ones who are old enough to follow clues, and read landmarks on simple maps. 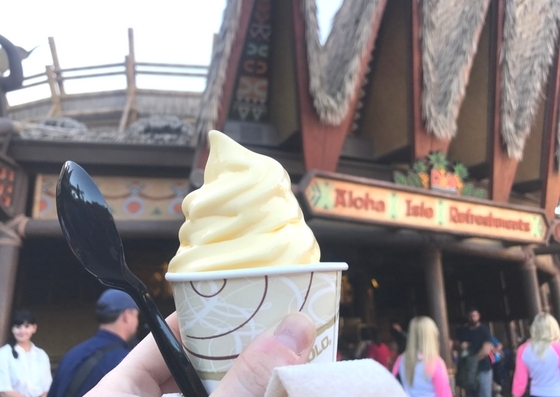 Now let's chat about one of my favorite discoveries...the Pineapple Dole Whip. YUMMY! We kept hearing people talk about these, and we decided we needed to see what they were all about. Listen, I totally get the hype now. The good people of Dole Whip are missing out on mass marketing this. I might be willing to give up my beloved Talenti for it - and that's saying a lot. Tip #8: Again, for new Disney adventurers...this delicious treat can be found in only four places in the entire Disney parks/resorts. For Disney World it is available at the Aloha Isle Refreshments in Adventureland. We did make it out of Adventureland, and looking back one of our favorite parts was that any time we passed the Castle their seemed to always be a stage show happening. The kids loved Mickey's Royal Friendship Faire before we headed towards Fantasyland. And in Fantasyland while Mr. Cute had The Cutes in line for the Barnstormer, I apparently decided to continue my Disney food tour from the previous day. I smelled something sweet in the courtyard, and found Big Top Treats. How cute are all those Disney themed treats?!? I purchased a Frozen themed Olaf cookie to share with all of the littles in our group who couldn't do the Barnstormer. It was quite tasty - just like everything else on the tour so far. Thank goodness for all those extra steps! Even thought it was mid-February, it was HOT. The Casey Jr. Splash 'N' Soak in Fantasyland was a fun little find for the kids (and maybe a parent or two) to cool off in. I think one of The Cutes favorite things was the Festival of Fantasy parade. We staged ourselves pretty close to the castle which was near where it started. We set our little crew up with some snacks and some waters about 30 mins prior to start time and were able to get a front row seat. The kids loved being right in the mix of everything! Tip #9: I learned that right as the parade starts a huge wave of people stop to watch. And fill in every little hole they can. Other adults (yes adults) did not care if they separated our kids from us as long as they got to see - so stay close, sit tight. The kids were so excited to see all of their favorite characters up close and personal. L.C. has a huge thing for Ariel and was so excited to see she was in the parade. For days she didn't stop talking about how she was out of water and waved her tail at her. And then I think she about passed out when her favorite princesses made their way to us. Everyone cheered for Belle and the Beast. I have a feeling the movie coming out next week is going to be a huge hit already because so many people were so excited. Not to mention Belle was the hardest princess to get fast passes for and had the longest line. Speaking of princesses right after the parade I had fast passes for meeting Tiana and Rapunzel. 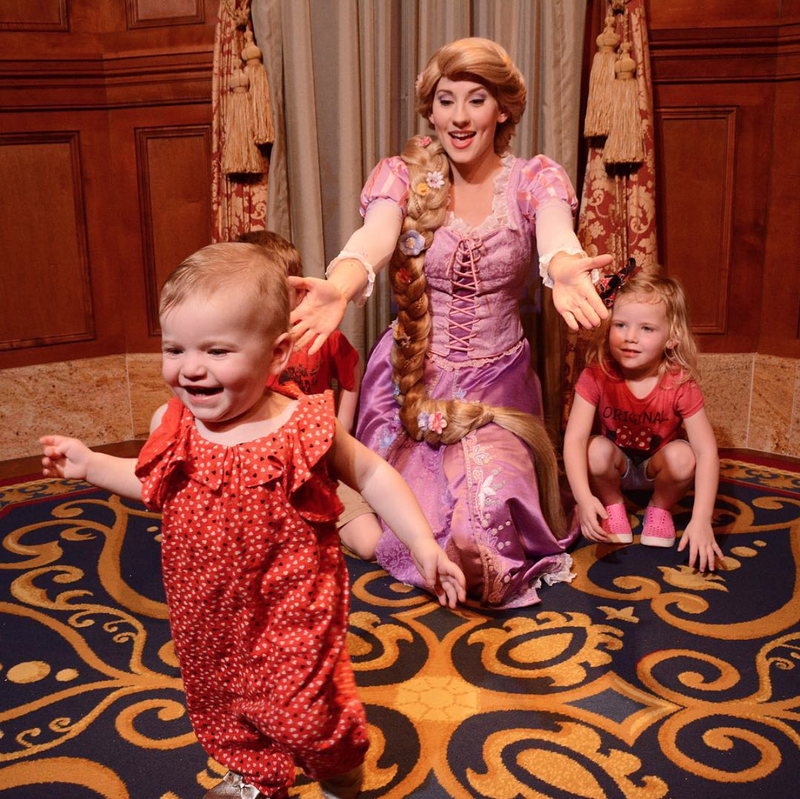 Tangled is one of The Cutes' favorite movies so they couldn't wait to meet Rapunzel in person. Right outside meeting them is Cinderella's glass slipper. I wasn't able to get a good picture, but it was so pretty I had to stop and take one. Now we have a million adorable posed pictures of the kids with the princesses but this one might be my favorite. Baby Cute was SO excited and kept running around. She was cracking everyone up. She would run up to the princesses, wave, go in for a hug, but then run off. And obviously having the best time ever. Everyone has to have a fangirl moment in their life. Tip #10: Put your name, address, and phone number in your autograph books. The cast member at this location saw ours labeled with it and our kids photos and thought that was genius. She said most people don't do that and then showed me a stack of lost autograph books. She said Disney will contact you - if they can - to return it to you right away. We found during our trip that Tomorrowland was the most crowded. A lot of the wait times were over an hour long. 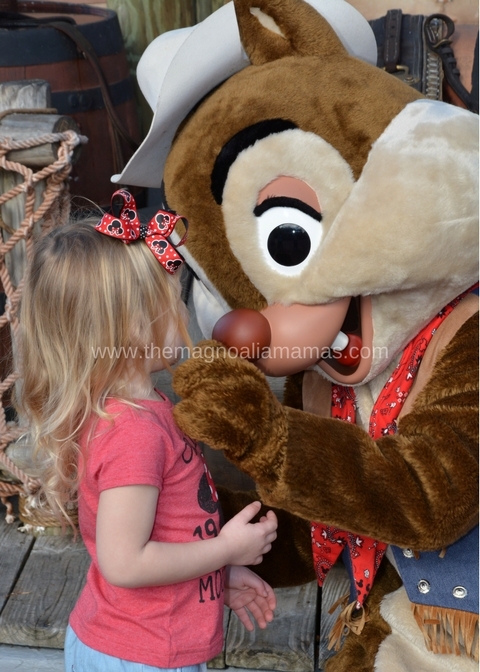 Luckily, I was able to get fast passes for the Toy Story ride - which was Cute's favorite of the entire trip - and Mr. Cute took Cute to ride the race cars, but most other things were packed. Mr. Cute said his favorite though was the Monsters, Inc. Laugh Floor show. Cute walked in and walked right back out when he was whatever was inside. He was still traumatized from the Bugs Life show from Animal Kingdom and didn't like something he saw. So Mr. Cute took L.C. inside to watch, and they said it was hilarious. After this we grabbed a snack and headed towards the Castle for the night show and fireworks. Everything on Main Street was so pretty lit up! It was amazing to see how they projected the entire show onto the castle. The Cutes were in such awe and L.C. kept clapping. 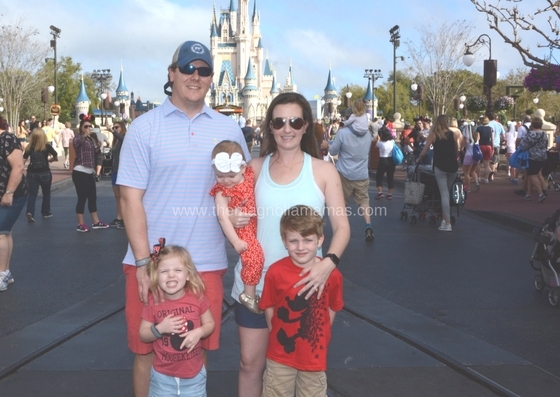 As soon as the show ended we headed out with our tired little ones (not to mention mommy and daddy were 23k + steps into our day and we were done too). Tip #11: Sit tight after the show. The fireworks start ten minutes after it ends, but the entire crowd got up. We didn't hear the speakers say it wasn't done (because the show was pretty spectacular already) and it was chaos. Like pushing, angry people, trying to get home chaos. Okay if you stuck with me this long, we have one more day I will share with you tomorrow! Dole Whips are my favorite! I'm with you on the mass marketing! I have seen where you can order on Amazon! EEK! What?!? Talk to me about this Amazon thing! Amazon is my jam and if I can get those delivered straight to my house...watch out! They were so so yummy!! Seriously though, details! Yes! Go to Amazon and search dole whips. It is the same soft serve mix that is used for the dole whips at Disney. Only you make them at home in your own maker. I'm seriously thinking of trying them out!